ALL money donated will go to support this site and my equivalent Scottish Guittar site https://scottishguittar.com – I give my time and money to these projects without financial gain. Anything you donate will directly help maintain these two sites. Your donation could help pay for annual fees to keep the site online, buy a string (I need lots of them!) or – if you can afford it – help pay for an instrument. I currently require £2,800 to pay for a baroque lute. This is a non-profit site, with every penny raised being invested in the site and its contents. Thanks in advance! Finally returned to this huge project, and fired up again to see it through. I’ve just added 25 pieces from the Rowallan manuscript. Hope you like em. Some Italian pieces here among the Scots tunes. I used a 7c lute by Bill Samson. I took a break from recording over Christmas and New Year, not just because I needed a holiday, but because my eyes were hurting badly when reading these old scores. Without glasses, the music was a bit out of focus. With reading glasses the music would be in focus IF my eyes were four inches from the page. So I’ve been to the optometrist, and have a new pair of glasses being made specifically for reading music at the distance I prefer – about arm’s length. They should be ready to pick up within a week or two at the most. Here’s hoping they do the job properly, and I can get back to recording. Bill Samson is loaning me his mandour, (or mandore, if you are posh) for the music in the Skene manuscript. So expect some of that afore long. Much of my previous performing and CD recording from Balcarres came from the D Major tuning section near the end of the manuscript, so much of what I have recorded so far is new to me, and I have to say I am impressed with the breadth of repertoire found in the first fifty. Yes, those beautiful pentatonic and hexatonic melodies are there, but also a deep French influence. Through the help of the internet, we even found one piece (no.34, Belle Heureus) is an arrangement of a song from a ballet by Lully. Some of the pieces seem to be by Scots in imitation of the French style. Looking ahead, of course, there are some bonny works by known Parisian lute players. Stay tuned. The reason for doing this marathon is to find out what exactly is there. Looking at international lute recitals, youtube videos, etc, the same pieces keep cropping up. It is my hope that lute players will broaden their appreciation of the variety of music in these manuscripts, and hopefully start performing some of the many neglected pieces. But I also hope that players of instruments other than the lute, such as harp, clarsach, pipes and fiddle (to name the more obvious) will take an interest. After all, many of these settings are arrangements of the early repertoires of these instruments. 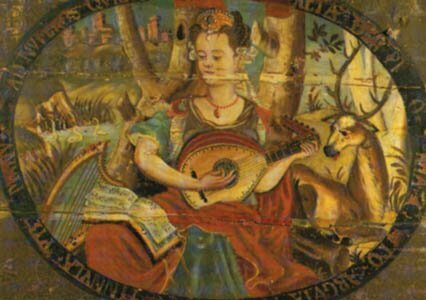 This site is dedicated to recording in mp3 format the Scottish lute repertoire. Clearly it is a long-term project, so do return as often as you can for udpdates, or register for automatic updates. Feel free to download the recordings for your personal mp3 player. Feel free to link to this site, add comments to it, send questions, and share with Facebook and Twitter. Do not feel free to copy this site in part or in whole to another site. It is covered by the Creative Commons License. No commercial use of any of its contents will be tolerated. All recordings are copyright to Rob MacKillop from November, 2011.